I am impressed and humbled by the enormous amount of emails, messages and survey entries I got from you on the last blog post. You made me laugh, you made me reflect on my work, you moved me to tears more than once. You are sensible, caring and curious people, you deserve all the effort and commitment I pour into cooking, photographing and writing. Even if it will require some time, I will get back personally to each one of you. Today’s recipe is dedicated to you, and the first part of a new project I am sure you will appreciate. When I was in Milan I had the chance to listen to a talk with Angela Frenda and Amanda Hesser, co-founder of Food52 and brilliant food writer. I also introduced myself with a handshake and a muddled speech on how inspiring her book Cooking for Mr. Latte had been for me. She has a striking imaginative language – the salted water for pasta which should taste like seawater and the spaghetti al dente, that are like biting into a new piece of gum, are just two of the many sentences I underlined and learnt by heart. I was also incredibly influenced by her approach to food and recipes. In one of the chapters of her book, which is also a food lover’s courtship, she explores the concept of having a cooking repertoire. It has been the most nourishing food for thought, as it made me reflect on my own cooking repertoire, on the identity you slowly shape adding recipes to your favourite list, on the never ending and vital process that brings you to introduce new recipes. Amanda Hesser, Cooking for Mr. Latte. What made me a mature adult with a clear identity is the continuous rhythm of cooking classes I had in the last six years. 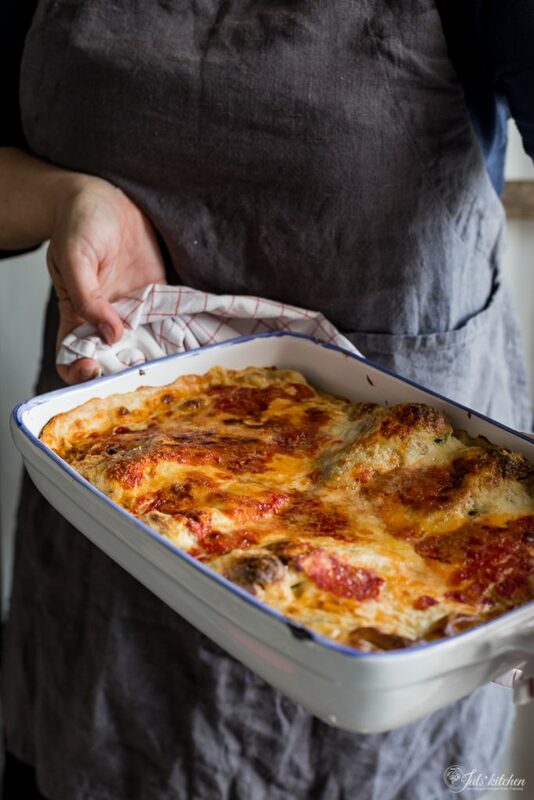 The blog has been the reason to keep investigating, the motivation to be curious and to learn new Tuscan recipes to add to my family repertoire. Some of them became so dear that I incorporated those dishes into my weekly routine, introducing them also into my cooking classes. Gnocchi are a good example. My mum would buy the gummy heavy gnocchi which were one of the only dishes I would gladly skip as a teenager. A few years ago, though, I decided to learn how to make those tiny pillowy gnocchi that are known as topini, little mice, in Florence. I posted about them, then submitted them to my students’ approval and now they are part of my Tuscan repertoire, dressed with seasonal vegetables, from asparagus to butternut squash, the cheese that happens to be in the fridge and fresh herbs. I refined the recipe over the years and now I am totally confident about it. My cooking class attendees are the family who helped me develop a reliable repertoire, a mental list of tested Tuscan recipes which tell a lot about who I am and how I like to cook and eat. This is also when I decided to leave aside recipes designed to impress in favour of those handy dishes you could cook on a moment’s notice, recipes that, according to Amanda’s words, would express my true sensibility as a cook, not my ambition. When you have guests for dinner you can rely on your trustworthy collection and enjoy the evening. In my list I would include spaghetti aglio e olio, pici with garlic and tomato sauce, tagliatelle with pork meat sauce, stewed French beans, roasted pork loin and chicken cacciatora, almond biscotti, olive oil chocolate cake and zuppa inglese. In the next months I’ll share these and other recipes, staples of a Tuscan repertoire, analyzing the ingredients and the process with plenty of details so that, if you want, you’ll be able to include them into your collection and make Tuscan cooking your signature style. Recently, after so many trials and minor adjustments, I promoted the crespelle alla fiorentina into my repertoire. A blanket of béchamel sauce, barely stained with a few tablespoons of tomato purée, files immediately this dish under the ‘80s label, when it was a staple in trattorie and households along with deviled eggs and tagliatelle con panna e prosciutto. I felt a shiver of nonconformism in reintroducing the crespelle in my repertoire and in presenting them during my cooking classes among other favourites such as pici, ravioli and gnocchi. They bring a store of knowledge, being related to Caterina de’ Medici and to the age-old French-Florentine dispute on who influenced who in cooking. Crespelle, the Italian cousin of the French crêpes, are first stuffed with a spinach and ricotta filling scented with nutmeg, another favourite of Caterina de’ Medici, then either rolled like a cannellone or folded as an handkerchief, hence the other name pezzole delle nonne. 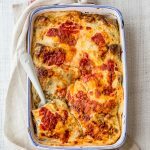 It is a handy recipe to learn as you can vary the filling according to the season: asparagus, artichokes and butternut squash are some of my favourites along with spinach and Swiss chard. 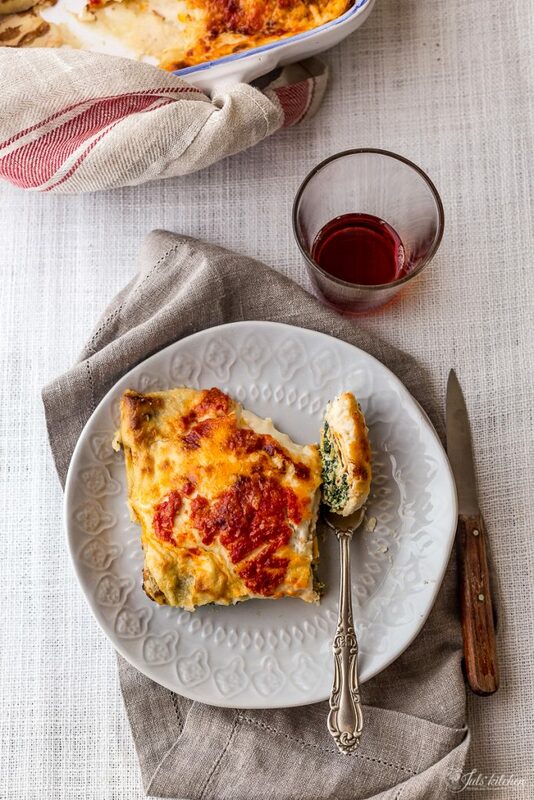 You can mix the vegetables with fresh milky ricotta or add some béchamel into the filling. Cheese is a welcomed ingredient: Parmigiano Reggiano, Tuscan or Roman Pecorino, ricotta salata, or any other savoury aged cheese that you would happily grate over your pasta. In the survey, some of you told me that you have hard times introducing vegetables into your teenagers’ diet: well, these crespelle can be filled with a good amount of vegetables, becoming a way to help them switch from eat vegetables because they are healthy to eat vegetables because they are actually delicious. 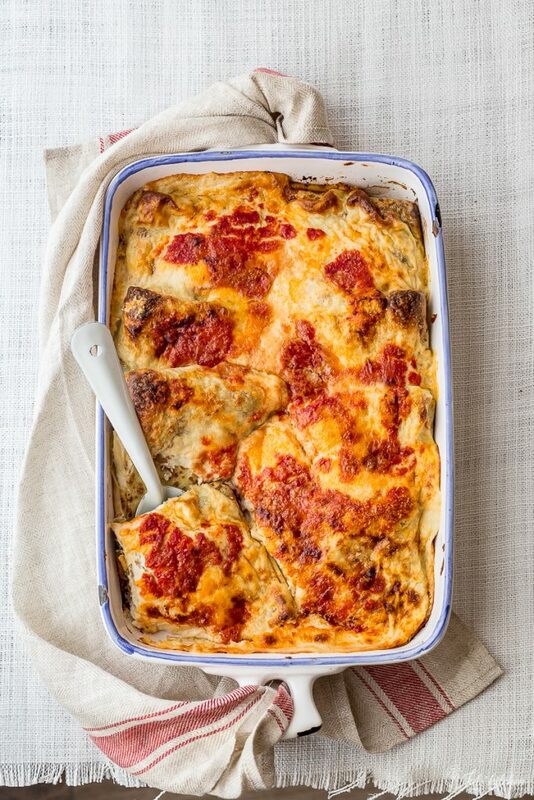 It might look like a demanding dish, but the good news is that you can prepare the required ingredients – crespelle, béchamel sauce, filling – in advance and bake it before dinner, or you can even prepare the final dish the day before and reheat it with a drop of milk before your family, or your friends, sit at the table. Now you see why this is a dish worth to be included in my repertoire! Prepare the crespelle batter. 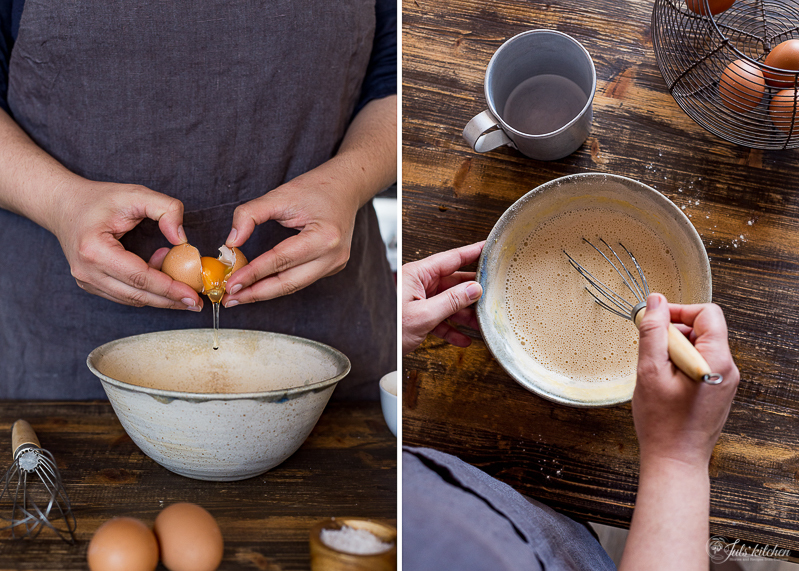 Whisk the eggs with flour and a pinch of salt. Remove all the flour lumps. Pour the milk in a thin stream and whisk to incorporates. Cover the bowl with cling film and put in the fridge for about one hour. Now to the filling. Wash the spinach and collect them in a large skillet. Pour in a few tablespoons of water, cover, and cook on low flame for about 10 minutes, or until wilted. Squeeze the spinach to remove the excess water, they should be as dry as possible, and chop them with a knife. In a pan heat the olive oil with the minced clove of garlic on low flame. When the garlic begins to sizzle gently, scrape in the spinach and sauté for 2 to 3 minutes until the spinach are dry and infused with the garlic flavour. Set aside and let cool down. 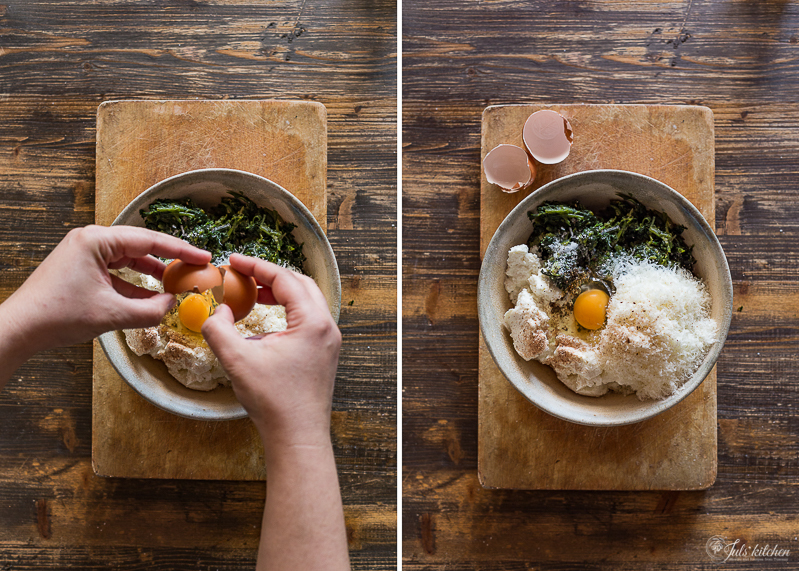 When the spinach are cold, add them in a bowl with the ricotta, the grated Pecorino, a pinch of nutmeg and salt. Mix with a fork as to have a beautifully marbled green and white filling. Taste it: it should have a faint smell of nutmeg and be savoury enough from the cheese and salt. Should it be too bland, add more grated cheese. Beat an egg and stir into the filling. Set aside. Prepare the crespelle: heat a 20cm large non stick pan on medium heat. Soak a paper napkin in olive oil and brush with it the hot pan. Careful with your fingers! 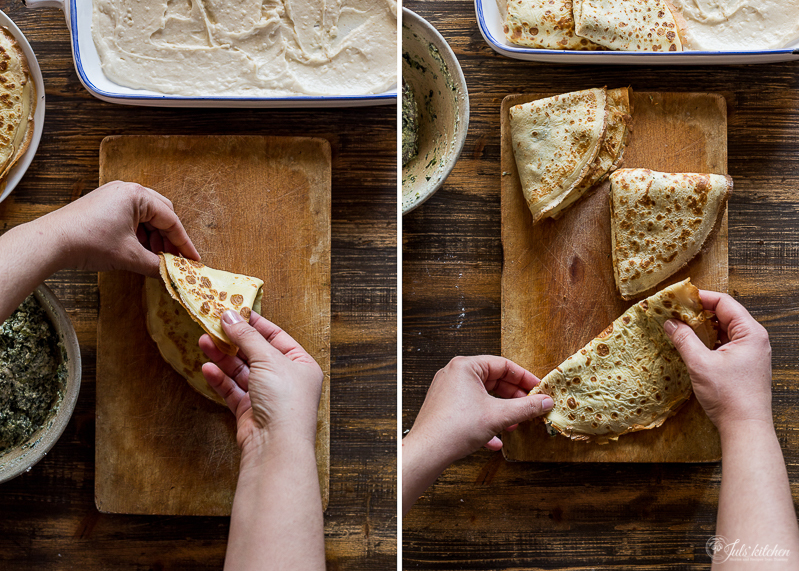 Pour the crespelle batter into the pan and swirl to cover it with a thin layer. Cook for 2 to 3 minutes until the crespella becomes golden brown on the edges, then with a spatula flip it and cook also on the other side for one more minute. Move the first crespella onto a plate and prepare the second one. You should obtain 8 crespelle. Now make the béchamel sauce. Melt the butter in a saucepan on medium heat. When melted, spoon in the flour and whisk for a few minutes until golden and toasted. Pour in the cold milk in a thin stream, stirring constantly to avoid lumps. Let on medium-low heat until thickened and season with a good pinch of salt and grated nutmeg as to give the béchamel a delicate spiced smell. Now that you have all the ingredients you need - crespelle, béchamel and filling - preheat oven to 200°C. 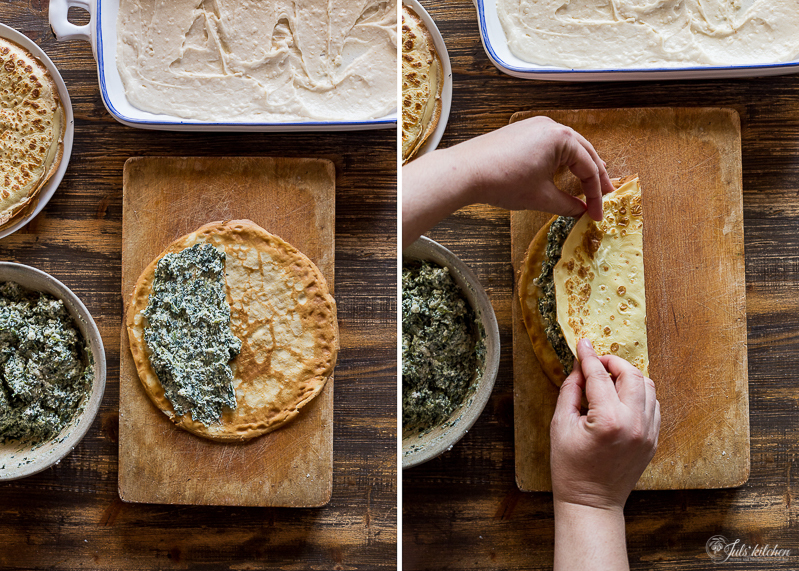 Spread each pancake with the spinach and ricotta filling: roll them up as a cannellone or fold them as an handkerchief. Arrange the crespelle slightly overlapping in a baking dish previously spread with a few tablespoons of béchamel sauce. 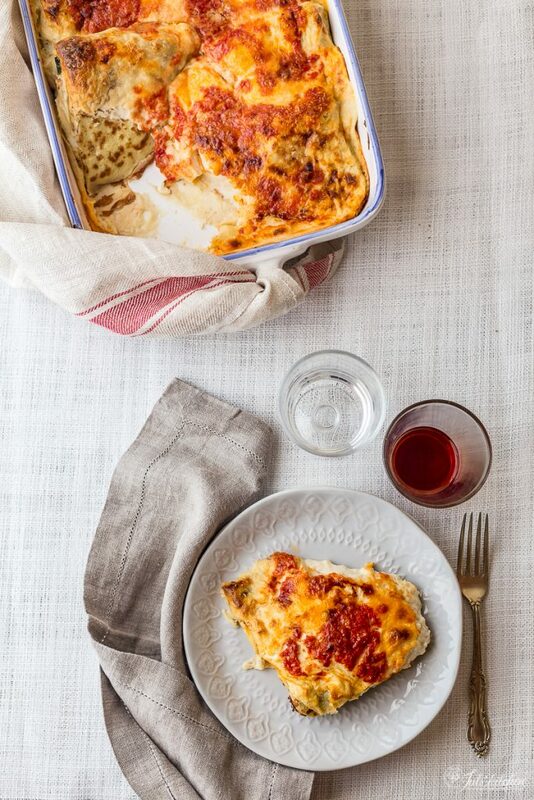 Drizzle the crespelle with the left béchamel sauce, a few tablespoons of tomato purée, more grated Pecorino and a drizzle of extra virgin olive oil. Lower the oven temperature to 180°C and bake for about 20 minutes until golden brown and bubbling on the sides. Eat the crespelle hot just out of the oven or, even better, warm them the day after with a dash of milk. 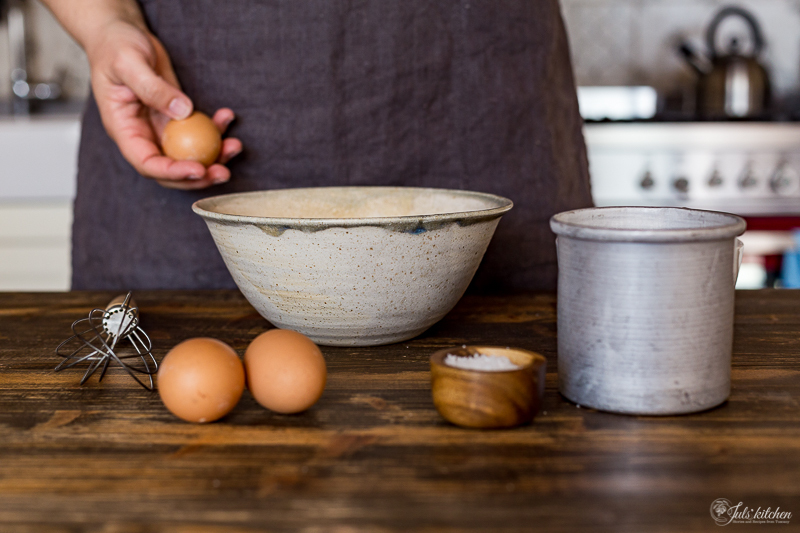 Do you have a cooking repertoire or, even better, do you believe in the usefulness of having a cooking repertoire? If so, which recipes are part of your catalogue? Did you learn those recipes from your family or by experimenting in the kitchen with cookbooks and magazines? 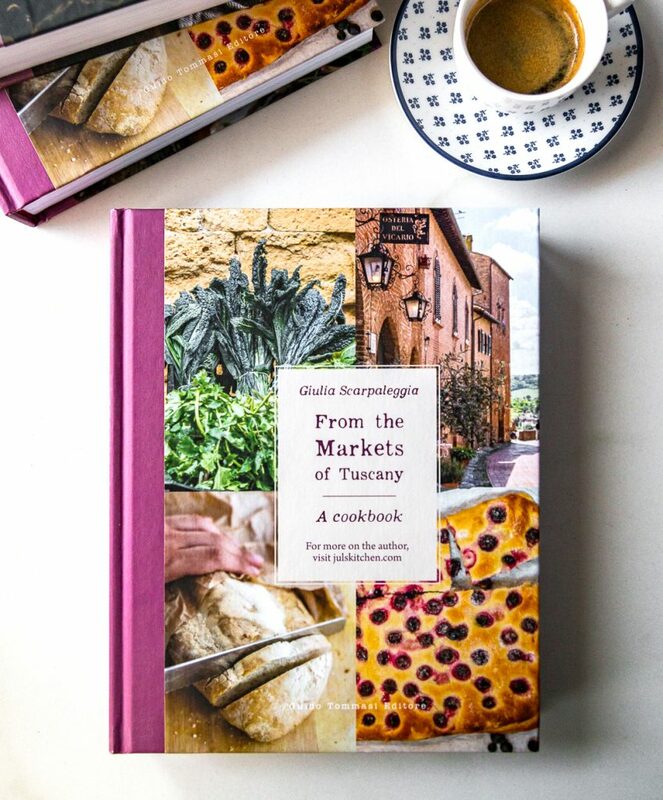 I would be enormously grateful if you could tell me something more about who you are, feel free to add any details, as I am so curious to discover who’s behind the screen, who is reading and using my recipes. Needless to say, I will use this data just for my personal use, to provide you with tailor-made recipes and stories. Answer in the comments of this post, via email at juls[@]julskitchen.com or filling up this questionnaire if you want to keep it simple and anonymous. Happy Easter everyone! Have a relaxing and delicious weekend! I believe I do have a repertoire I’m trying to refine. I cook a lot of fish dishes — one of our favorites is Tuna with Caramelized onions. It’s super simple but so delicious!! Another is Salmon with Pesto over arugula tossed with roasted leeks and shitake mushrooms. I’ve taken bits from what my mamma did in her cooking and expanded on it. Another recipe I make time and again is farro with grape tomatoes – it’s a one pan dish that is so good yet so very easy! I love to cook and when I want something in a hurry I go to my favorites. I can’t wait to make your crespella alla Fiorentina. Buona Pasqua! I am slowly building my repertoire, a vegetarian repertoire that is, my family is not vegetarian so that’s a little difficult. I’m trying to adapt Mexican dishes for this: my favorites are pastel Azteca , a dish made of fried tortillas,tomato sauce, black beans, poblano chiles and cheese. And portobello fajitas, and any tipe of quesadillas! I have been trying to stretch a dollar or two recently. So my repertoire has been somewhat cucina povea. I love cucina povea, I hope I got that right! It is such simple food yet comforting. And delicious. 5 or less ingredients and they all shine through. My grandparents were from Naples and were not rich. So I hope that what I make might be similar to meals they ate. I feel that connection is important. I have taken a class at my favorite restaurant to learn their recipe for gnocchi. They do come out like little pillows of air! I enjoy your recipes, love your book and can not wait to try this recipe! I can’t rate the recipe yet because I haven’t made it. But, oh, my I know I will love it. I am an Irish Catholic Chicago area girl who married into a Tuscano family (here in the U.S.) I started learning about what I then considered to be exotic foods — antipasto, tortellini soup, fried zucchini flowers and cardone, ragus, home made pasta, frittata, Casata alla Siciliana, use of fresh fresh food and herbs. My mother-in-law made the most wonderful beef ravioli – perfectly spiced, succulent, juicy. I’ve never had any quite as good since she passed on. This was in the last half of the last century, so we Americans were still ooing and ahing about all these new additions to our culture. I learned from my mother-in-law and all the aunties who learned from their moms and mothers-in-law. It gave me such a sense of time and continuity. So these foods became the core of my repertoire but I have branched out into other mediterannean cuisines, as well as French. Not to mention that American cuisine has become much more sophisticated since the TV dinner, fish stick, and macaroni and cheese (ala Kraft) days. But for me, I’ll never forget the first full course Italian meal at Mamie’s house. It changed my life and my perception of feasting with wonderful but simple food. thank you so much for your heartfelt comment Katherine, what a rich culinary heritage you have! I have to thank you. I know you will add to this heritage. next post: Minestrone from scratch. File under adulting.